A federal judge in Boston has denied a temporary injunction against President Donald Trump's travel ban. A seven-day restraining order was granted Sunday in a lawsuit filed by the American Civil Liberties Union on behalf of two state university professors who were detained at Boston's airport as they returned home from an academic conference. The professors are Muslims from Iran and lawful permanent U.S. residents. "We stand here proudly today to challenge this clearly unconstitutional, illegal and unpatriotic executive order from the Trump administration," said Carol Rose, executive director of ACLU Massachusetts. "How the court rules today is going to set an important precedent nationwide." She called Trump's order "a clear abuse of power" and said it must be pushed back. An amended lawsuit filed this week added new plaintiffs, including the international aid group Oxfam America and several noncitizens who are legally in the U.S. but fear if they leave they'll be unable to return. Massachusetts Attorney General Maura Healey also has joined the lawsuit. "We're proud to stand beside the ACLU and the attorney general of Massachusetts," said Darius Teter, Oxfam America's vice president of global programs. He said the organization assists 2.5 million refugees in four of the seven countries named in the travel ban, and said the executive order has "severely constrained" its ability to do that work. 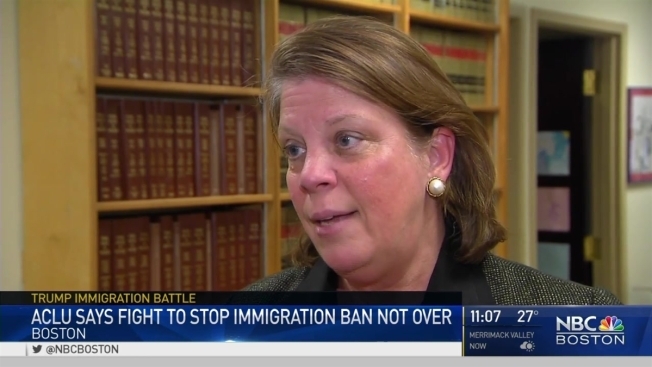 Healey issued a statement Friday calling Trump's travel ban "reckless" and saying that it violates the constitutional rights of Massachusetts residents and threatens the state's economic vitality. She said she looks forward to "permanently overturning this unconstitutional Executive Order." The Boston hearing was one of several similar hearings being held Friday in courtrooms across the country, including in Washington, Virginia, New York and Michigan.